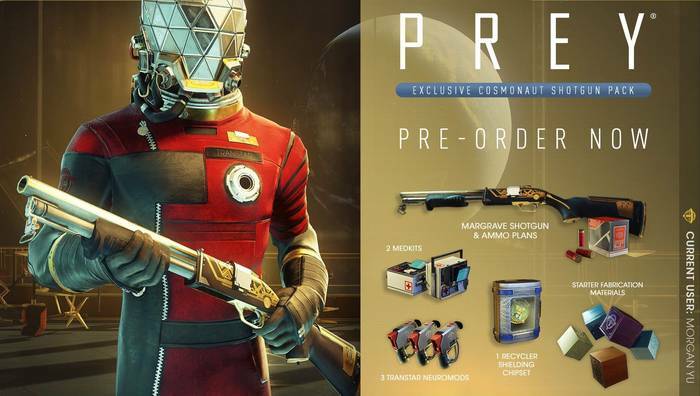 Pre-ordering the game grants players access to the Cosmonaut Shotgun Starter Pack, which includes some awesome equipment and a unique shotgun. With Arkane Studio’s anticipated first-person action game Prey set for release on May 5, 2017, we take another look at the awesome DLC that awaits eager players pre-ordering the game. Margrave Shotgun – A family heirloom passed down in Morgan Yu‘s family, it gives players a powerful weapon very early in the game to deal with the Typhon menace. Three Neuromods – Players will obtain three Neuromods on the fly for a headstart at unlocking abilities from the different specialization trees in the game. Two Medkits – While not too difficult to obtain in the game itself, it never hurts to have a little more of recovery supplies to increase survivability in the game. Fabrication Plan for Shotgun Ammo – Complementing the Margrave Shotgun you’ll receive in the DLC is a Fabrication Plan to create Shotgun Shells. You won’t ever hear that dreaded click on a bad time at any point in the game. Starter Kit for Building Tools and Weapons – Allows players to create certain useful items and tools early in the game. Recycler – Given the limited resources you can salvage aboard Talos-1, any means to preserve as much as you can is a welcome help in any situation. This is possible with the Recycler upgrade you’ll get with the DLC. Be sure to check out our Prey wiki page for walkthroughs, strategy guides, and tips and tricks!